So I am finally slowing down right now. My midterms are finally done and my classes are going onto new topics in the subjects. Man do I sometimes wish I was back in elementary school. Where the teachers didn’t expect so much out of you as they do now. And we had recess? Remember those days? But anyway onto the topic that I am going to be writing about today. So as I get stressed out, I often look to baking as a way to release stress. Not only are you relaxing, at least for me for I know some people who just freak out when baking or cooking is involved, but you are also making treats for you or your friends. Recently I have been in a chocolate mood which I am not sure why but I’m not really questioning it because fact it. Us women, we tend to have weird cravings at weird times. 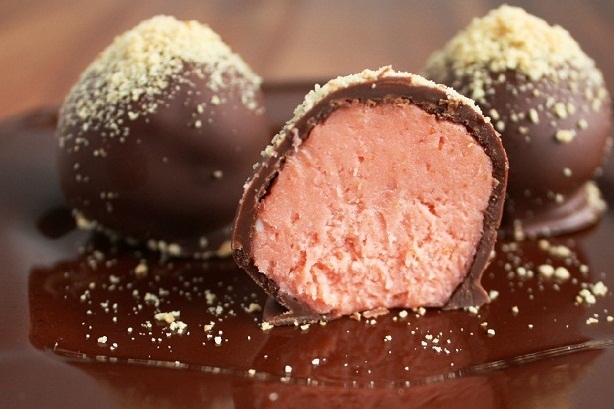 I have this amazing recipe for raspberry truffles. Which I later found out are super amazing that my friends are now hounding me for more. It is very simple but does take time and patience with the truffles to make them good. ***I did put in 13 graham crackers to make it less tasted of graham crackerness. And I found that you probably need to add more than just 3 Tbsp of raspberry jam. I put in 4 Tbsp which was better in taste, at least what I thought. But I did not have raspberry extract which would probably made a slight difference. I also found that 1 3/4 cup of chocolate is not enough in this recipe to cover the filling of all the truffles. I would say put in more like 2 1/3 cups of chocolate or so, but that is all with just practice. And one last thing that I found was this does not make 22 truffles. After many times of making this, I found that my friends prefer when truffles are small and not big. Make the filling the size of oh I would say a teaspoon or so. A tablespoon size truffles ends up being way to much for anyone. My last batch made about 70 truffles.